Sunday Lunches are usually special in our house. I don’t know why. Maybe because I lighten the breakfast and skip cooking dinner. Whatever the reason, these meals bring much happiness, smiles and cheer. So, one such beautiful sunny day our lunch was a full blown punjabi meal. 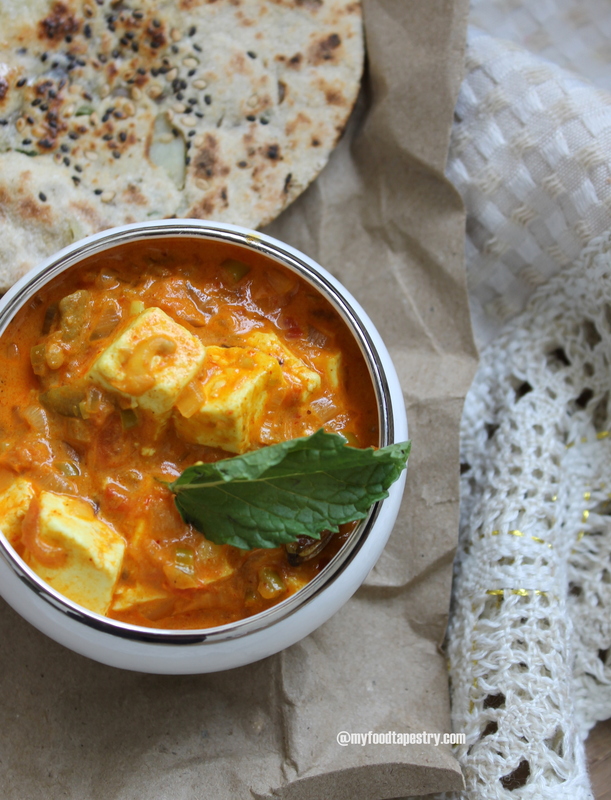 Delicacies using paneer or cottage cheese is very integral to the vegetarian Punjabi. 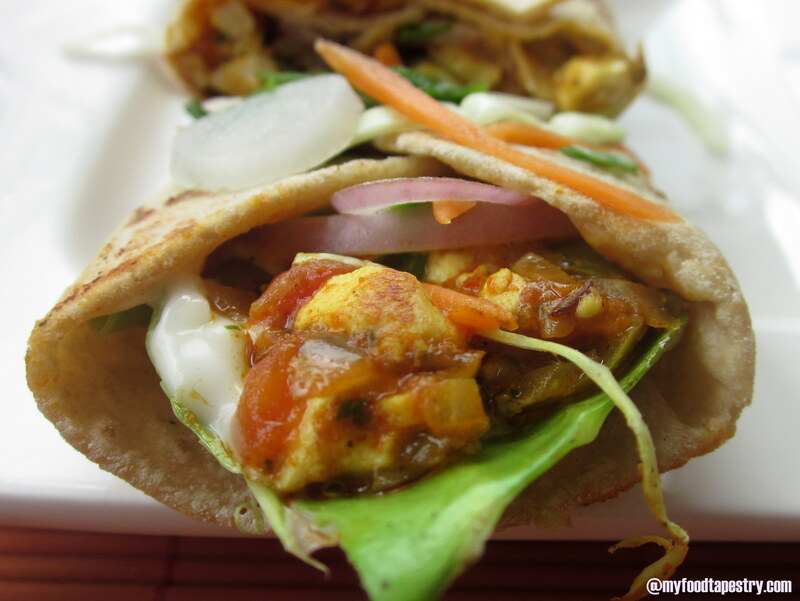 If you are going to refuse tandoori chicken and lamb kebabs, then paneer is the The Protein for you. 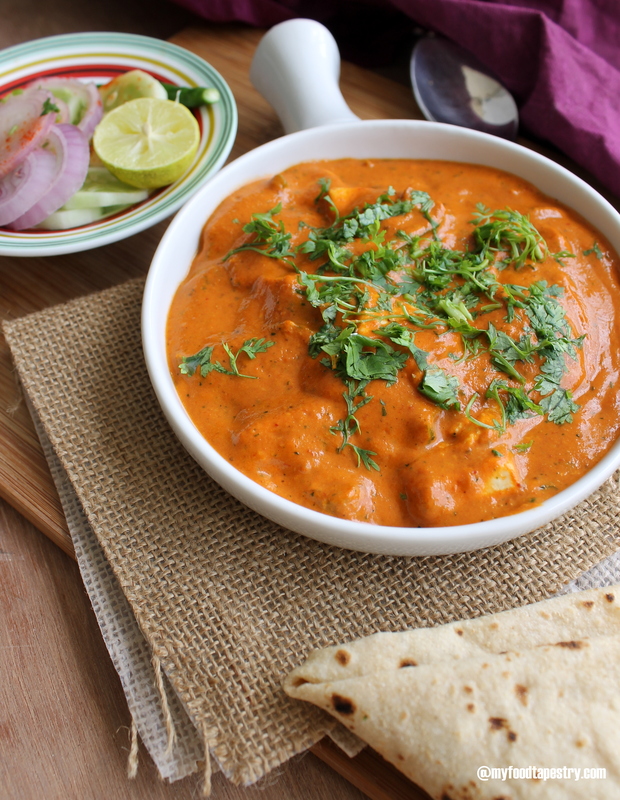 The cuisine comprises of lip smacking dishes with chickpeas, paneer, whole black lentils and copious amounts of cream and ghee. 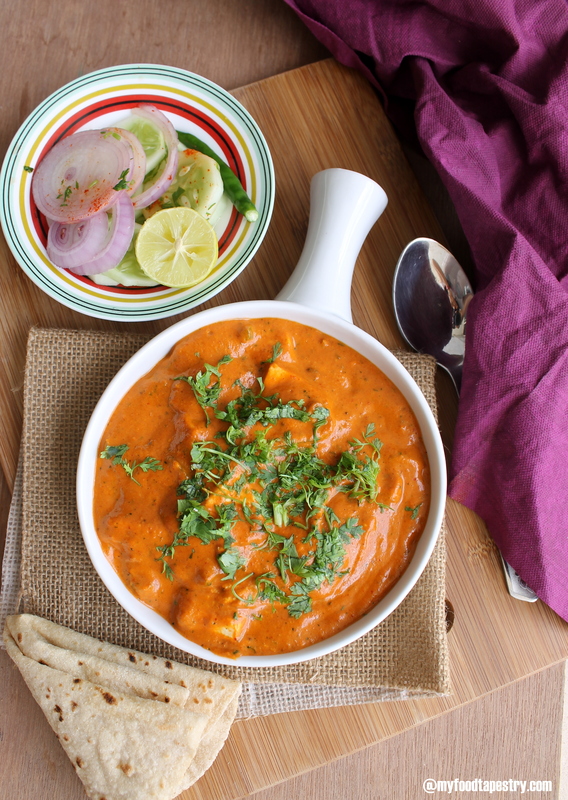 Punjabi food was the hottest cuisine to tuck into back in the late 70s and 80s. 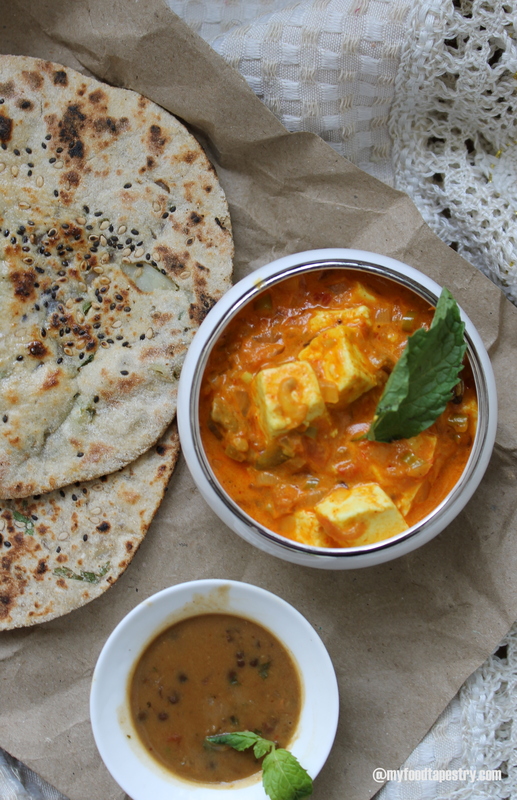 That Sunday I made a creamy paneer side along with vegetable stuffed oven baked unleavened bread and some rich whole lentil dal. The dishes are heavy and little bit of it stuffs you up. But we like to make it just the way it should be. No fat free version, no zero oil. This kind of lunch makes us forego dinner and just snack on salads and soup. 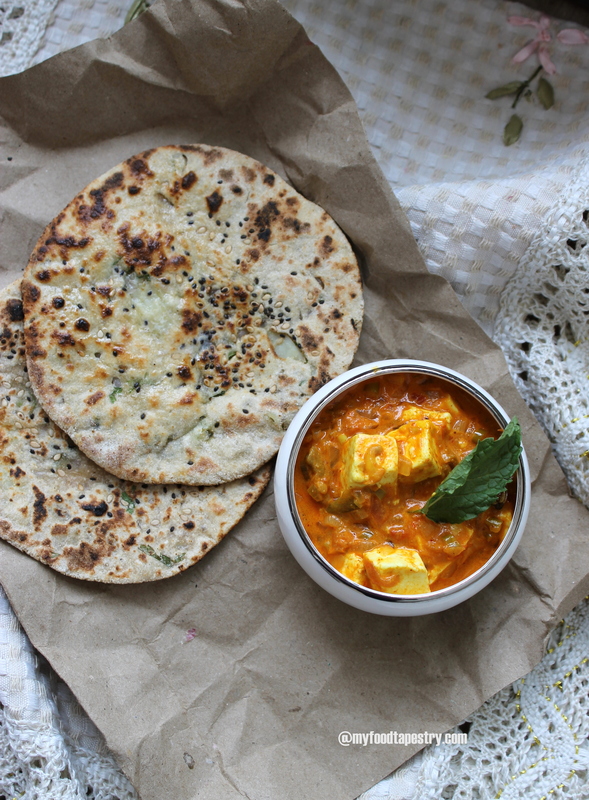 I have recipes for the paneer and the flatbread. Saving the dal for another post. 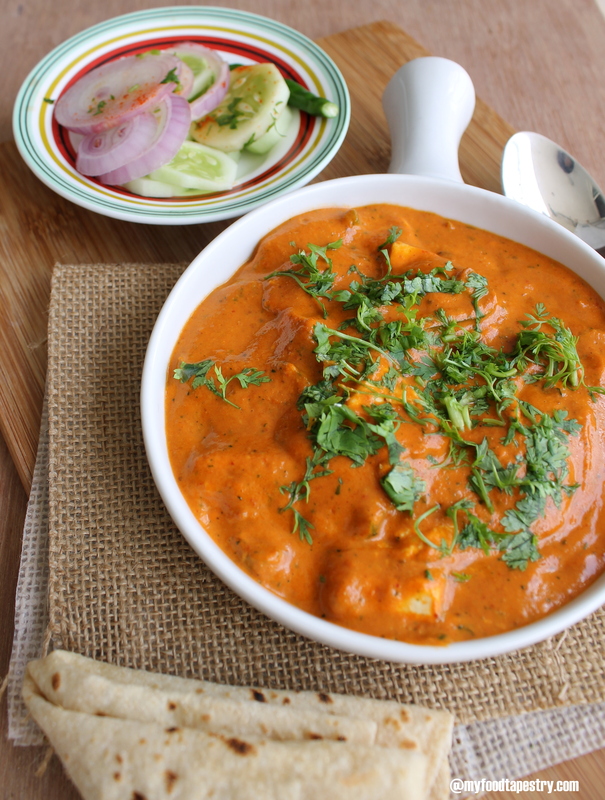 Shahi paneer is a wonderful aromatic curry made using cream, tomatoes and spices. 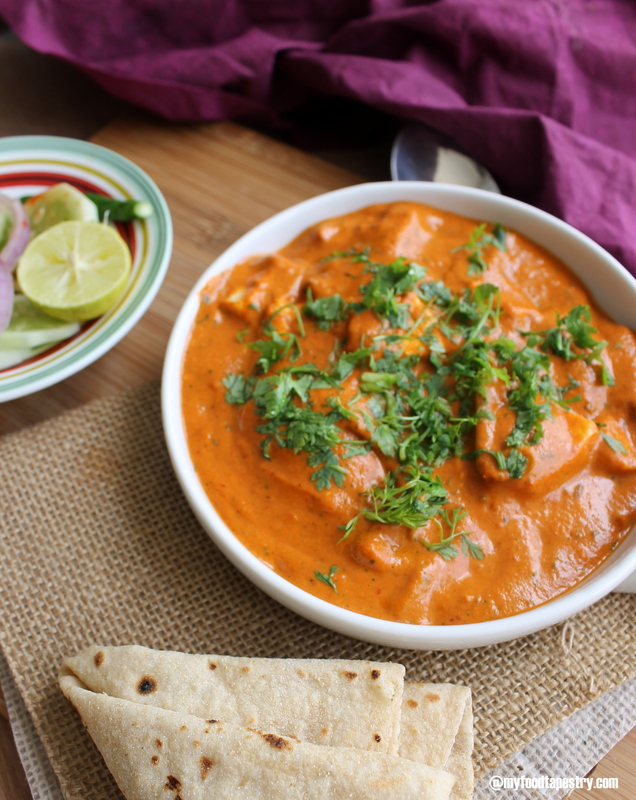 This is my second favourite recipe of the cheese after Makhani Paneer. optional: 1/2 cup mushrooms or bell peppers. 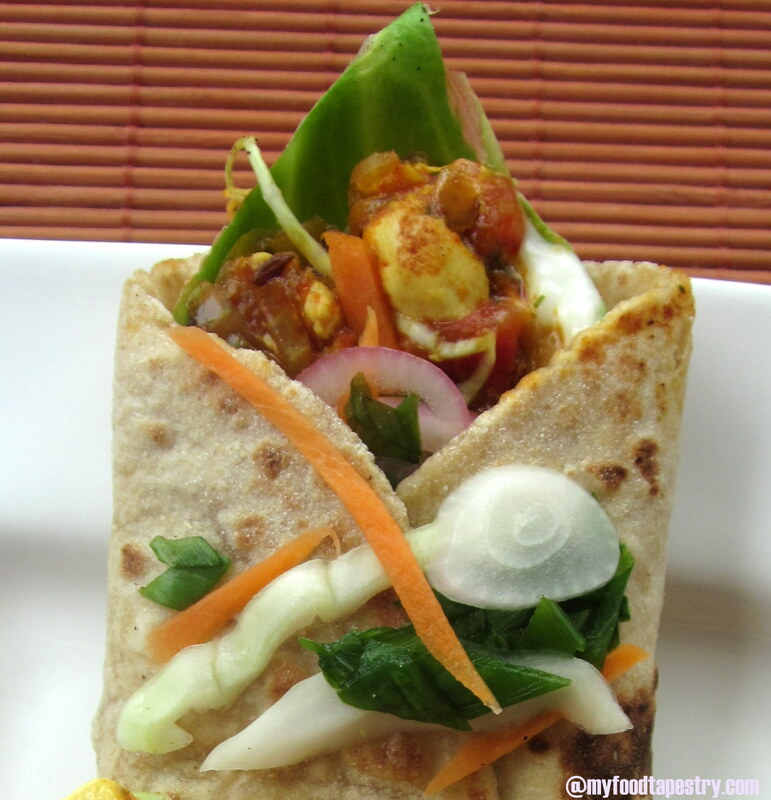 To garnish: coriander leaves or mint leaves. In a wok, heat ghee/butter. Drop the bay leaf, cardamom, cloves and cinnamon. Saute for just about a minute. Crackle the cumin. Add the minced garlic, ginger, green chilies and onions. Sprinkle little salt. Cook till the onions turn translucent. Remove the whole spices if you’re afraid kids will bite into it. Add kasuri methi and fry for another 30 seconds. Now add the tomatoes, along with red chili powder, coriander powder, turmeric powder and salt. Cover and cook till the fat leaves the sides. Takes approx 10-12 minutes. Once that is done, stir in the cream. Mix well. Give it a boil. Stir in the tandoori masala. 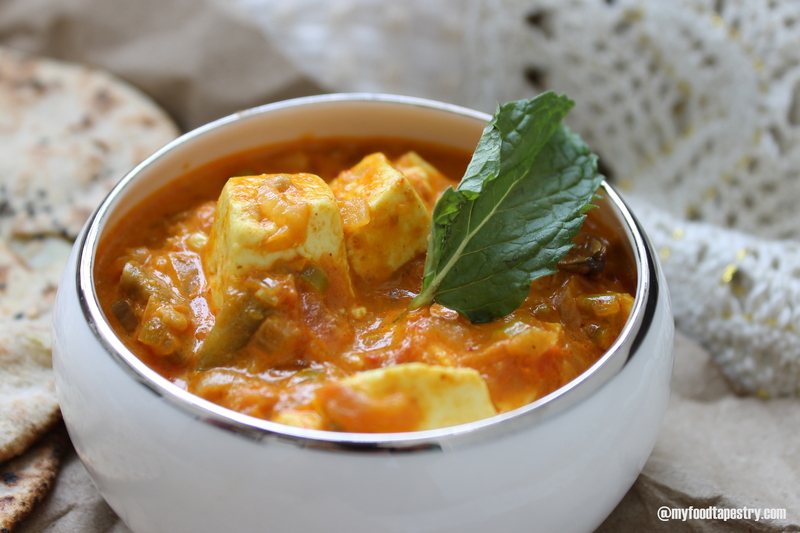 Add chopped cubes of paneer. 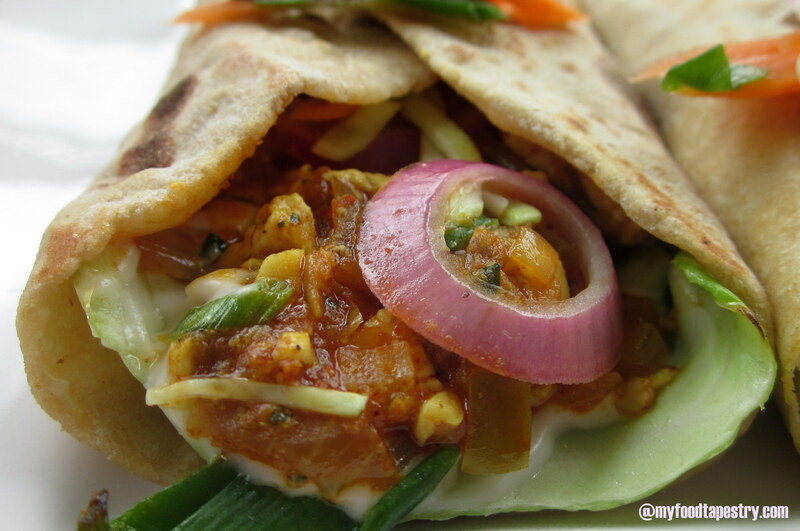 Switch the flame off, garnish with coriander leaves or mint. Serve hot with any flatbread or rice. Note: If you want to add other vegetables, sauté the chopped veggies in a different wok using very little fat or oil. 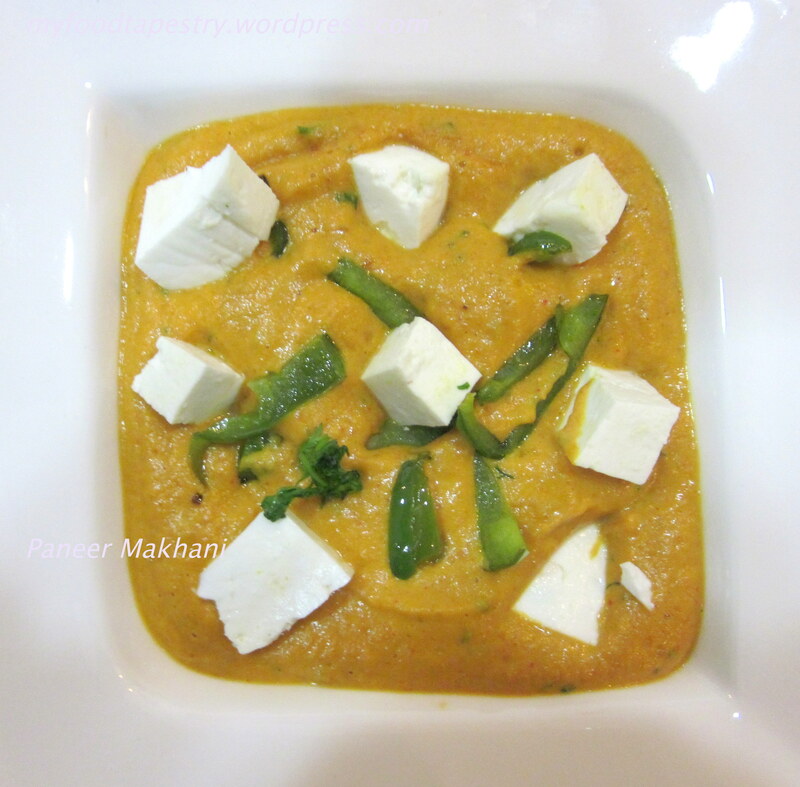 Stir the sautéed veggies when you add paneer to the onion tomato cream mix. Note: Mincing the veggies really fine is the key here. Makes the gravy come into one harmonious mix. 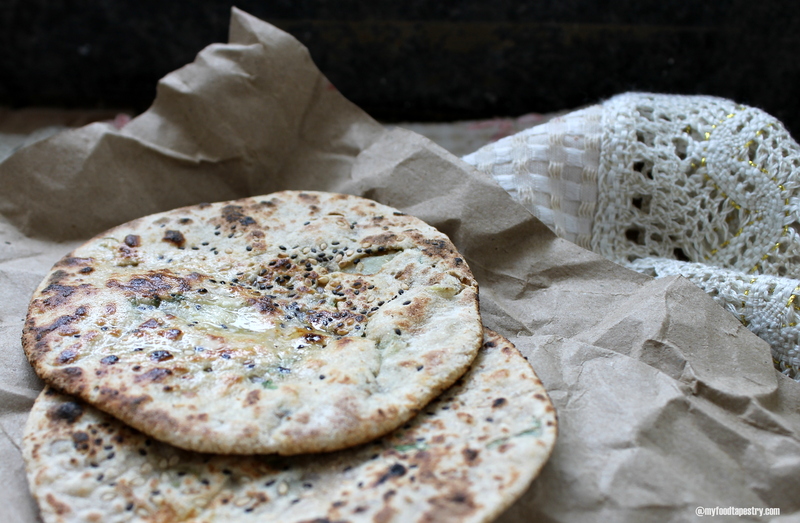 Kulchas are small round Indian bread made from flour, milk, and butter, typically stuffed with meat or vegetables. Some use leavening agents like yeast or baking powder. I have skipped the leaveners and used whole wheat instead of refined flour. Dotted with nigella seeds and sesame seeds these little breads are extremely nutritious and very easy to make. 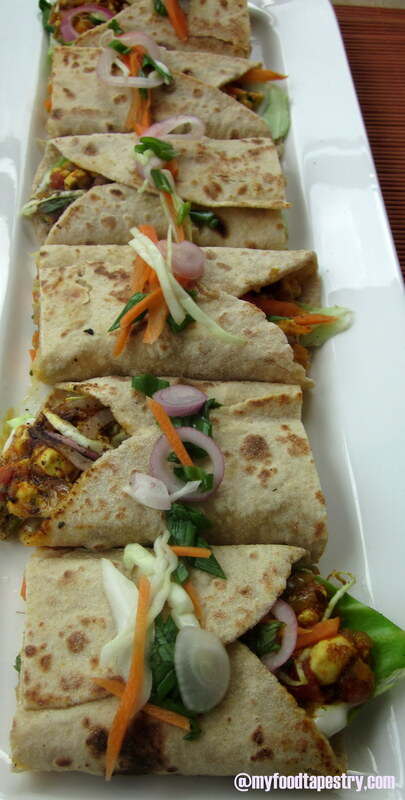 The stuffing I used was made with crushed boiled potatoes, minced onions and coriander leaves. 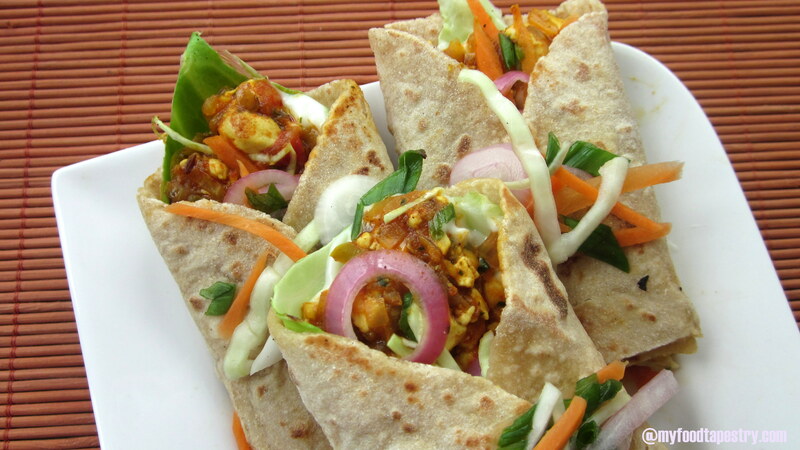 You can be innovative and use any grated vegetable you like. 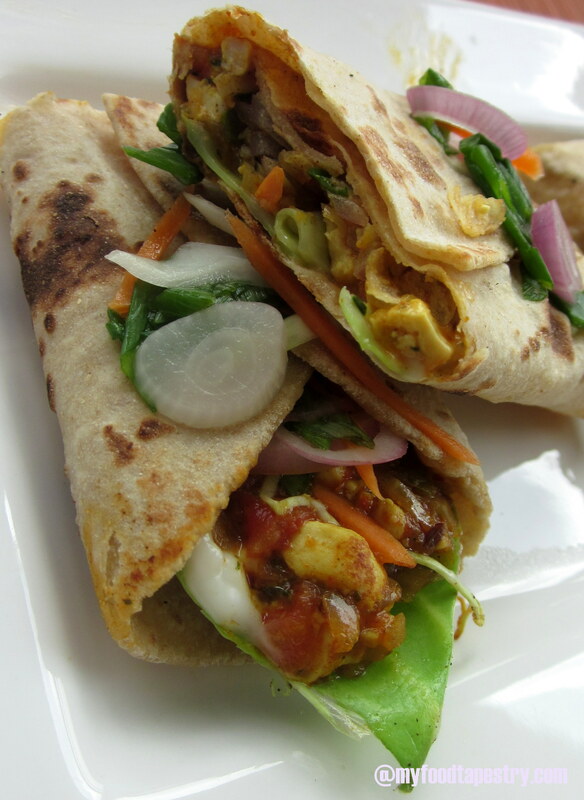 Carrots, cheese, cauliflower, peas make great fillings too. 1 tsp white sesame seeds and 1 tsp nigella seeds, mixed and set aside. To serve: ghee or white butter. To the flour, add salt, carom seeds. Using luke warm milk bind the dough. Use more milk if required. The dough should be soft and pliable. If you like, you can add a bit of cream or ghee to the flour before binding. Once done, keep covered for 30 minutes or more. 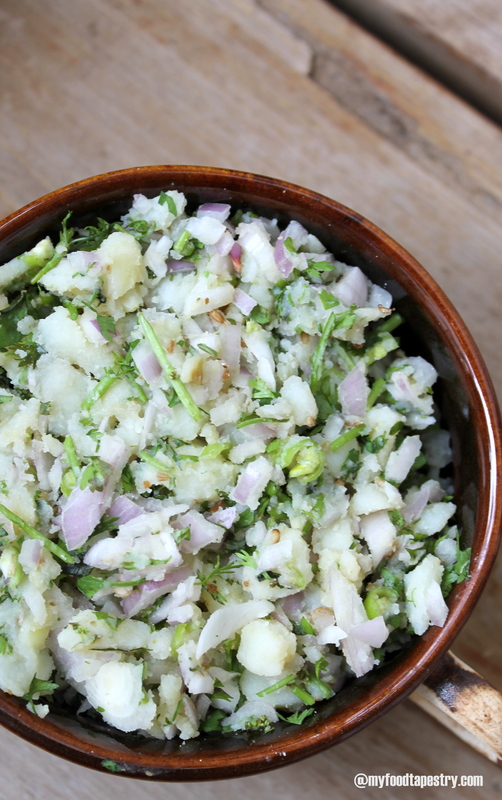 For the stuffing: Use boiled potatoes, minced onion, green chilies and coriander leaves. Mix well, add salt and cumin powder. Heat a flat griddle or tawa. Grab a handful of the dough, make a well in the centre, put a tablespoon of the stuffing, close it like a basket. and using more flour roll it out into a small circle. Before placing the rolled out circle onto the griddle, sprinkle some mixed sesame and nigella seeds. Press the seeds into the dough using the rolling pin. Carefully pick the rolled out circle and slap it onto a semi hot griddle. Once it browns a bit, flip the kulcha and roast a bit from the other side. 1. 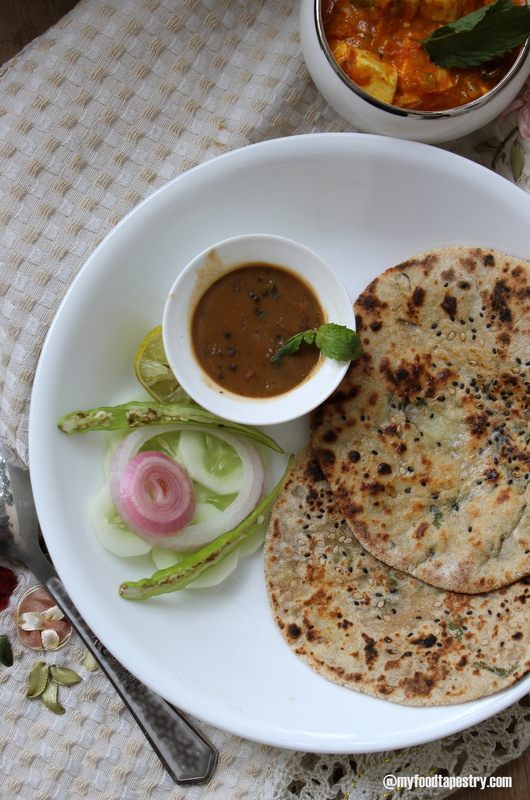 You can use a tong and directly roast the kulcha on an open flame till it browns beautifully. Serve hot with ghee or butter on top. 2. 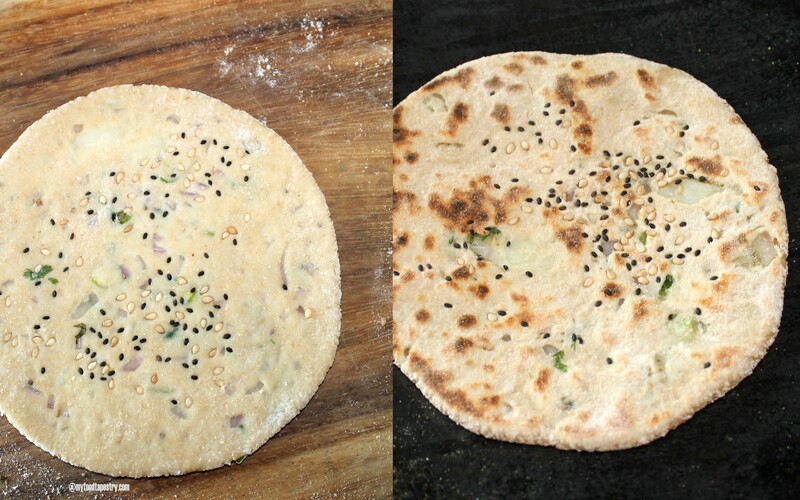 Pre heat the oven to 200 degree C. Place the kulchas on a tray and bake till they brown. Takes approximately 6-8 minutes. Serve with ghee or butter. 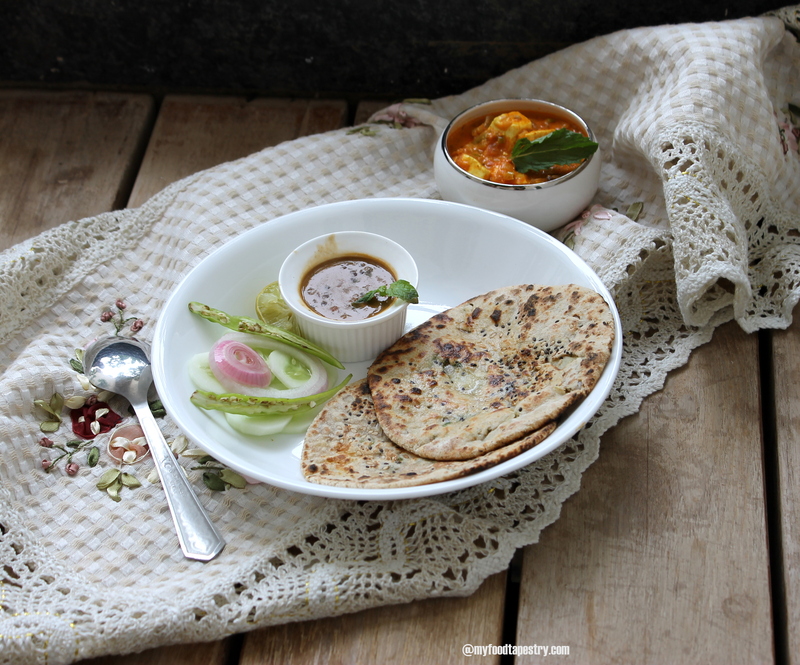 Kulchas taste great with paneer, kali dal, amritsari channe and many more! Note: If you add spices to the stuffing and use it for filling the kulcha, it will be good enough to eat with a bowl of yoghurt. No curry, sides or lentils required then. Whole urad lentil and rajma is soaked overnight and pressure cooked. 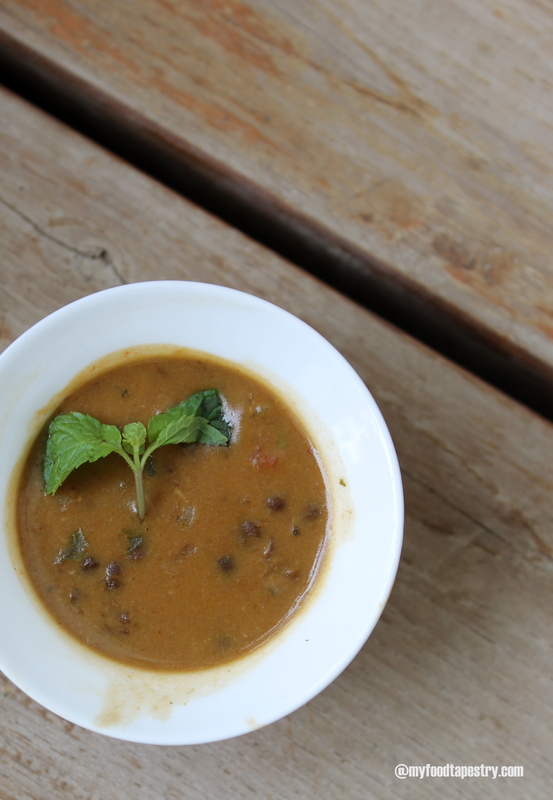 Cream, ghee and milk is again used copiously in this dal. It is so rich and whole I felt it deserves a space of its own. 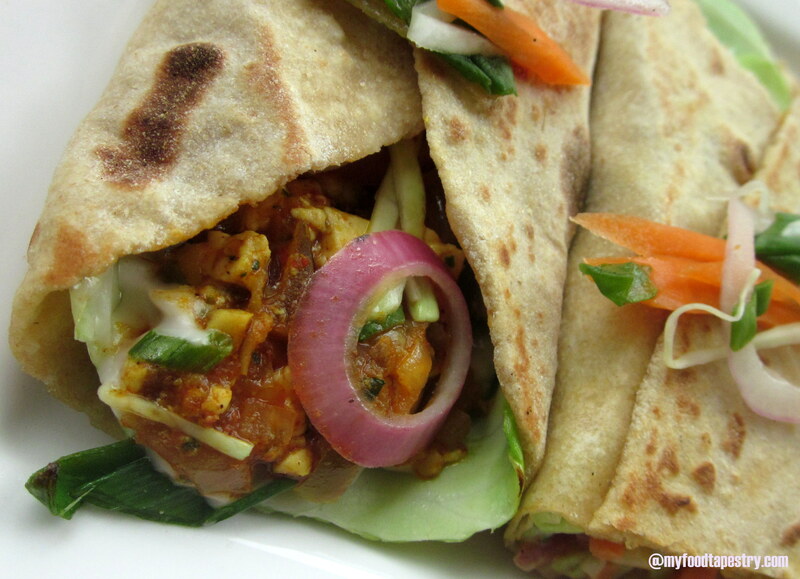 So another post will carry the recipe and mouth-watering pictures.